INDEPENDENCE, OH (TM216) — The AFC Cleveland Royals grab a 2-1 win in the first round of the Hank Steinbrecher via a last-gasp combination between 90’ substitutes Reymar Klotchko and Ian Larson. The win sets up a cup final between the Royals and PDL club Michigan Bucks at Stan Skoczen Stadium June 3 at 7:30 pm. AFC Cleveland got out to a quick start thanks to a 3’ Tom Beck goal after receiving a brilliant deep pass from Mike Derezic. Playing from ahead, the Royals kept pressure on their opponents and searched for a second against their Maryland-based opponents. Christos FC, who thrive in cup competitions, kept the Royals honest and nearly broke through with an equalizer on multiple occasions in the first half. Christos FC would find their equalizer in the 61’ from forward Pete Caringi as the Royals were temporarily down a man with centerback Coletun Long receiving treatment for an apparent leg injury. The rest of the match involved end-to-end opportunities for both clubs, but it appeared the match would be decided in extra time as the score remained tied late in the 90’. On the last few touches of the game, Larson was given the ball near the left endline before sending a hopeful cross into the box. Klotchko used his fresh legs to elevate above the Christos defense and head home the winning goal. Tom Beck put the Royals ahead in the 3’ with a clean shot past Christos goalkeeper Brad Benzing. Derezic saw his right winger making a blistering run down the right side and lobbed a leading ball which landed near the 18-yard line. Beck positioned himself between the ball and outside defender and used his first touch to put himself in a scoring area. Beck calmly drove his shot past Benzing. Brian Potocnik started an opportunity by gaining possession deep in the Christos attacking end via a turnover and advanced possession for a counter attack opportunity in the 6’. The midfielder tried to play Ben Truax into space in front of goal, but the pass rolled beyond the reach of Truax and out of play. Christos FC attacking mid Danny Baxter nearly tied the match in the 12’ after shooting from the right corner of the goal area. The shot was driven low across the face of goal, but drifted inches away from the left goalpost. A Ryan Ware cross connected with Traux at the near post in the 17’. The forward managed a touch toward goal with the outside of his foot, but the attempt was easily corralled by Benzing. Josh Taylor looked to score in the 22’ after the Royals conceded a free kick in a dangerous area. A short pass was played along the left wing and crossed into the box. The scuffle in the box resulted in an opportunity for Taylor, who kicked the ball into the net before realizing the assistant referee waved for offsides. Baxter played a searching ball with the outside of the foot in the 23’ to a streaking Elton Joe, who zipped past the Royals defense and headed a shot wide left of the post. Ware put an outstanding curled attempt from the top of the box in the 33’. The shot seemed destined for the top right corner before Benzing stretched to push the ball just over the crossbar. The Royals had another opportunity to score in the 45’ when Admir Suljevic played Beck through into the box. Beck used a spin move to beat an initial defender, then launched a shot that was blocked by another Christos defender. Ware moved in for a secondary shot, but also saw his shot blocked by the swarming Christos defense. Jordan Becker put the Royals under pressure immediately in the second half with a cross that nearly connected with forward Pete Caringi. Royals goalkeeper Alex Ivanov dove forward to punch the ball away from trouble. AFC Cleveland countered with a chance of their own minutes later as Truax found Beck alone on the right wing. Beck took a couple dribbles along the endline before squaring a pass across the face of goal. Despite the traffic in front of goal, the ball was not met by an attacker for a shot. Royals defender Coletun Long left the pitch in the 57’ with an apparent leg injury, but returned to the game in the 62’ to bring the home side back to full strength. In the meantime, Christos FC used the man advantage to find an equalizer in the 61’. Pete Caringi finished a pass from Levi Houapeu that was lofted over the shorthanded AFC Cleveland defense. Tom Beck once again generated an opportunity along the right side, dribbling towards goal and locating Suljevic alone less than 10 yards from goal. The captain’s shot went well over the bar and out of play. The home crowd erupted in the 77’ with appeals for a penalty kick when right back Chris Cvecko was knocked down in the box, but no foul was given by the head referee. As the Royals continued to roam freely along the right flank, Cvecko once again found Suljevic near the penalty mark in the 79’. Suljevic attempted a headed shot towards goal, but saw the shot sail just above the crossbar. AFC Cleveland was sure they had gotten the late go-ahead goal from a counter attack in the 82’. Substitute Dan Koniarczyk advanced possession deep into the attacking third before laying the ball to Truax, who took a dribble past Saunders and looked to finish in front of an open net. The shot was incredibly blocked by a Christos defender at the goalline, denying the clear chance. Reymar Klotchko had barely been on the pitch for a minute before burying the game-winning goal off a cross from left-back Ian Larson, another 90’ substitute, which effectively ended Christos’ hopes for a cup final appearance. 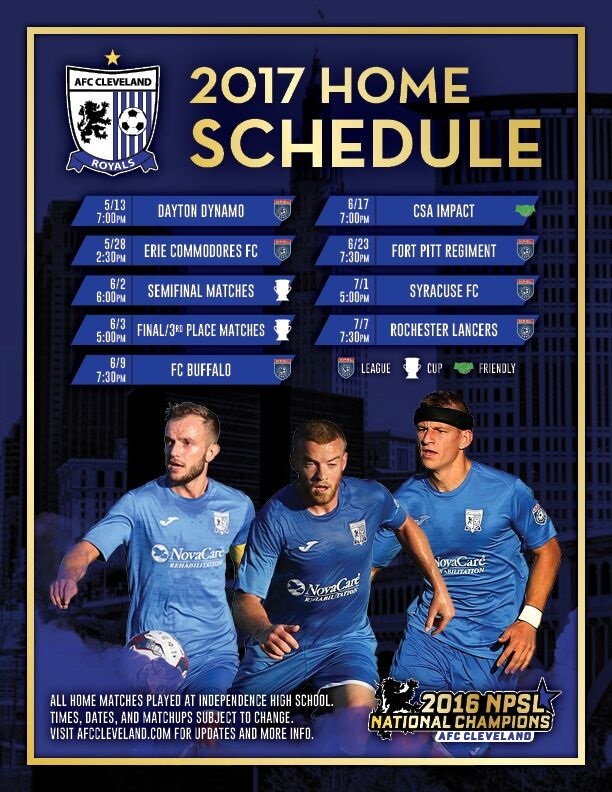 With the late winner, AFC Cleveland earned a spot in the June 3 Hank Steinbrecher Cup Final against the winner of the first game of the night, Michigan Bucks. The game will be played at after the third-place matchup between Christos FC and Chicago FC, with an estimated kickoff time of 7:30 pm.